There were 742 press releases posted in the last 24 hours and 153,513 in the last 365 days. 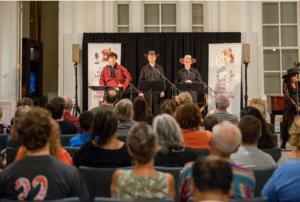 The L. Ron Hubbard East Coast theatre performing Mr. Hubbard's western fantasy story, “Shadows from Boot Hill” at the Scientology Information Center in downtown Clearwater on October 26th in Downtown Clearwater. CLEARWATER, FLORIDA, USA, November 1, 2018 /EINPresswire.com/ -- On Friday October 26th, the L. Ron Hubbard East Coast Theatre brought "Shadows from Boot Hill," L. Ron Hubbard's only western fantasy, to life at the Scientology Information Center, giving attendees a case of the pre-Halloween spooks. Guests attending the show enjoyed complimentary refreshments and a set of Halloween-themed songs including "Spooky Little Girl Like You," all performed by the theatre's producer and narrator Joanie Sigal. The performers reenacted the eerie fantasy western story of "Shadows from Boot Hill" where the actors, lighting, sound effects and "living shadows" left the audience checking for their own shadows on their way out. "Boot Hill" is a 19th-century name for the burial ground of gunfighters or those who "died with their boots on." One guest, Sophie, said "What a story! It actually gave me the chills when the ‘shadows' would come out and follow him around!" Michael, another guest exclaimed, "What a creative presentation! I loved it! These performances are always great!" "The Wild West was actually full of ghost stories and superstition," said Amber Skjelset, Manager of the Information Center and event organizer. "So “Shadows from Boot Hill” follows a rich history of storytelling and folklore." The L. Ron Hubbard East Coast Theatre is a volunteer group founded in 2011. Their shows combine actors, costumes and sound effects, bringing the exciting pulp-fiction stories by L. Ron Hubbard to life. L. Ron Hubbard was among the most prolific and popular writers of the Golden Age of Pulp Fiction. Indeed, between 1934 and 1940, some 140 L. Ron Hubbard tales appeared in the pages of legendary pulp magazines—with as many as three titles an issue and bylined under some fifteen pen names. With 19 New York Times bestsellers and more than 350 million copies of his works in circulation, Mr. Hubbard is among the most acclaimed and widely read authors of our time. The East Coast Theatre's next performance at the Information Center will be a rollicking adventure called, "River Driver" on Friday, November 30th completing their 2018 performance schedule. The Scientology Information Center is open daily from 10 am to 10 pm. For more information about the theatre's next performance please contact Amber Skjelset, Manager of the Scientology Information Center at (727) 467-6966 or email amber@cos.flag.org.